It’s hard to be a rich Chinese property developer these days. Profits are still booming, for sure. And property development remains one of the most powerful engines of the economy. But when developers look ahead, they see diminishing profits – and diminishing favour. To stay at the top of the tycoon pile, they are quickly diversifying, embracing the government’s new pet industry – tech. Think robotics. Think green cars. Think artificial intelligence. In a sign of the shift under way, one of China’s largest property developers changed its name from Longfor Properties to Longfor Group, saying the new brand is “more aligned with the long-term business strategies,” which include “continuous innovation”. “It is not easy to negotiate with the government if you are purely a property developer currently,” Longfor CEO Shao Mingxiao recently told the South China Morning Post. Chinese developers had a bumper year in 2018, with industry sales rising 14.7 per cent to a record US$1.8 trillion, or seven times the property transactions in the US. But the party is coming to an end, as the slowest economic growth pace in almost three decades forces owner-occupiers and investors to postpone their purchases. 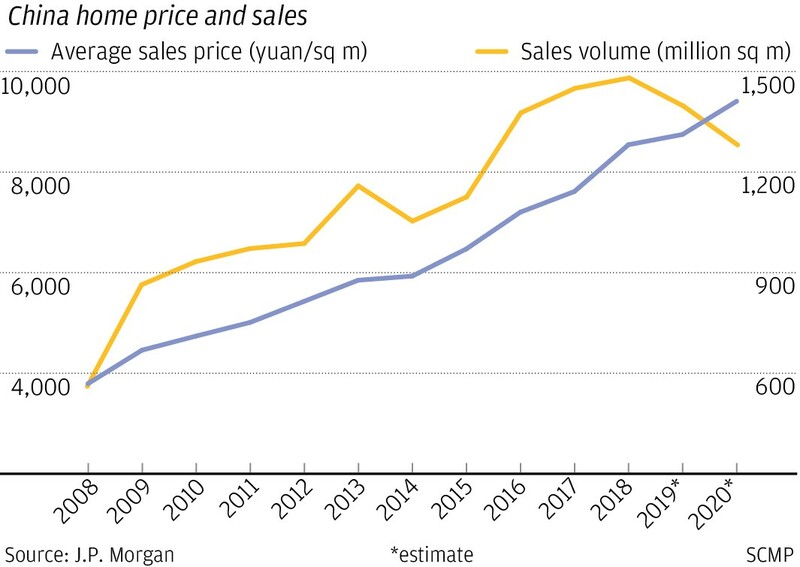 The order books are full of semi-built homes, with 1.45 billion square metres of housing waiting to come on line in the coming two years, according to JPMorgan Chase. Sales are likely to drop 3.4 per cent this year, with another 1.5 percentage point decline forecast for 2020. The warning signs are already visible, with 20 out of 24 developers tracked by JPMorgan Chase missing their 2018 sales targets. 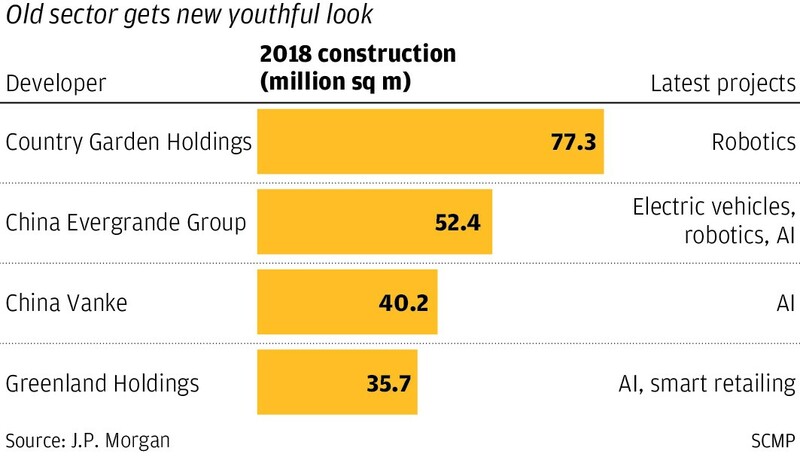 Not even the five biggest builders by market capitalisation – Country Garden Holdings, China Evergrande Group, China Vanke, Sunac China Holdings and Poly Real Estate Group – were spared. In response, Chinese developers are remaking themselves. There’s an old Chinese saying, qiong ze bian, bian ze tong, tong ze jiu, or “adversity leads to change and change leads to prosperity”. For Chinese developers, the adversity has been coming in the form of government restrictions, like price caps and resale restrictions, as well as mounting debt that is hard to manage because private companies aren’t favoured for bank loans. That is leading to the change. 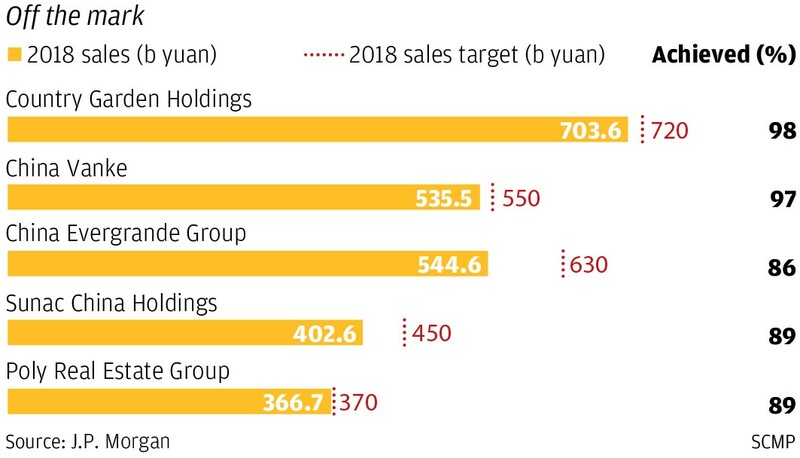 Country Garden Holdings, China’s top residential developer by sales, says it will become a hi-tech conglomerate, pouring 80 billion yuan (US$10.2 billion) into the robotics sector, which it notes will be a big cost-saver. In another example, Evergrande, the country’s third-largest developer by sales, is taking a spin in electric cars. To be sure, the early experiments can be painful. Sun Hongbin, chairman of Tianjin-based Sunac China Holdings, ranked fourth by home sales in mainland China, said its 18.6 billion yuan investment in video streaming platform Leshi was a “failed investment” that cost the company. But Sun said he would continue looking for ways to expand. “Without the experience of pain and suffering from a loss, even the smartest person cannot grow,” he said at a news conference last year. “Self-determination and innovation is the unavoidable path … to climb to the world’s top as a leading player in technology,” Xi said last May. How does Beijing plan to lead the world with ‛Made In China 2025’? Now his message echoes in speeches by developers, like one by Yeung Kwok-keung, founder and chairman of Country Garden on January 22 at the company’s annual gathering. “We are paving the road to become a hi-tech company,” Yeung said. “We will embrace an era of robots building homes. It is just a matter of time. We must get it done and this will be our competitive advantage in the future,” Yeung added, identifying property, smart agriculture and robotics as the company’s three core businesses. The developer’s first robotic restaurant in Shunde will open after the Lunar New Year while its first robotic construction worker will help build a house in the second half of this year. Meanwhile, besides electric cars, Evergrande has a US$16 billion worth blueprint for its move into hi-tech sectors, such as life sciences, aviation, quantum science, new energy, artificial intelligence (AI), robotics and modern agriculture. Greenland Holdings, the sixth-largest China developer by sales last year, invested 300 million yuan in AI and smart retail company DeepBlue Technology. And China Vanke has entered into ventures with some big tech innovators, including Microsoft, artificial intelligence start-up SenseTime, and China electric vehicle maker Nio. With Microsoft, for example, it is looking at smart home projects, among others. AI, big data, Internet of Things (IOT) and cloud computing can help Vanke build up the basic platform of its core business, Vanke CEO Yu Liang said at the World Artificial Intelligence Conference 2018 in Shanghai. Technology will become the new driver of Vanke by 2024, he said. “In the future, hi-tech will empower Vanke’s full-service system to create a more future-oriented China,” Yu said. To be sure, developers aren’t abandoning their property cash cow. The CEO said cost control is the top reason the company is turning to robotic construction. “We are now talking about construction work worth 600 billion yuan. If we assigned 200 billion yuan to robotics, we would save 5 per cent of the cost. That is huge,” Mo added. Cheng Guangyu, Country Garden’s vice president, says that robots are more efficient than humans at repetitive tasks. The company has been testing out robots that cook and do building tasks. But Shen Jianguang, chief economist at JD Finance, said developers understand that diversification into pet projects of Beijing will be helpful to their property projects. Alan Jin, property analyst at Mizuho Securities Asia, described the period of experimenting that developers are going through as lots of anxiety but also lots of new hope. Even Wanda Group – which unloaded US$9.3 billion in hotel and tourism after drawing the ire of Beijing over its huge overseas shopping spree – is learning how to safely expand its focus to be in line with Xi’s visions for the country. Only a few years ago, chairman Wang Jianlin said he would overwhelm Shanghai Disney with a series of extravagant theme parks. Now, after selling down assets and getting past regulatory scrutiny, he is building a US$1.74 billion theme park that will recreate the 1930s Communist Party’s revolutionary birthplace in Yan’an, with visitors able to dress in liberation army garb.